Being a business owner comes with an endless list of things to do. Ticking off items on your to-do list is a daily challenge, especially because you’re working around limited resources like time and money. That’s why you can use your Freelancer account to your advantage. With access to millions of freelancers, you can get help for almost any type of job be it design, finance, admin, marketing, or programming related. Enlisting the help of freelancers lets you run your business like a well-oiled machine and prevents you from getting snowed under. 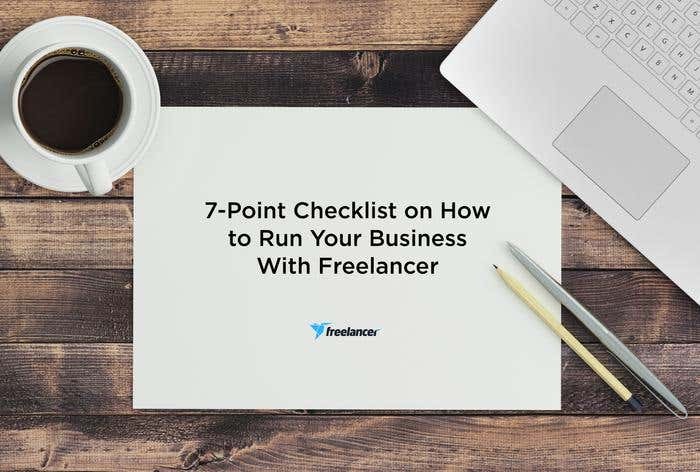 To make sure you always have the much-needed manpower, here’s a checklist on how you can run your business with Freelancer. Freelancer is a powerful tool for getting things done. While you plan, identify which projects you’ll need to hire freelancers for. No project is too small or too big. There will always be freelancers who are ready to help you hit your targets. Jot down all important details and requirements for your project. Be as clear as you can and provide support files as needed. Make a shortlist of bids that offer favorable rates and turnaround time. You can also message freelancers who bid on your project if you need to clarify details. Now that you’ve got a shortlist of freelancers, go to each of their profile pages. Look through the summary, ratings, employer feedback, and portfolio. You might need regular content for your social media page or continuous site updates. Building a team will be more efficient than searching for a different writer, graphic designer, social media specialist, or software developer each month. Communication is key to a successful project. We want to make sure you have tools for remote collaboration, which is why Freelancer has a chat feature that allows video calls and group chat. Use it to get on the same page as a team. There’s also the mobile app that lets you to message freelancers and post projects and contests anytime, anywhere. This can be your lifesaver when you need something urgent while you’re on the go. Not only can you post projects on Freelancer but also contests. Posting a contest is using crowdsourcing to your advantage. With contests, you can have a variety of options. Then you award your best pick or a bunch of them. Another great thing about a contest is you can use it for promotions and market engagement. You can post a logo design contest and a create a poll for the best entries. That way you’d know which design best resonates with the crowd. It can be a hectic workweek but always remember that you have access to millions of freelancers from around the world. They are always ready to get the job done for you the moment you’ve posted your project.